With over 5 years of experience within the health industry Nicola understands the importance of person-centred approaches to health care. Whilst studying podiatric medicine at university Nicola worked as an Allied Health Assistant for a national health care provider and also assisted in the management of a locally operated podiatry clinic. 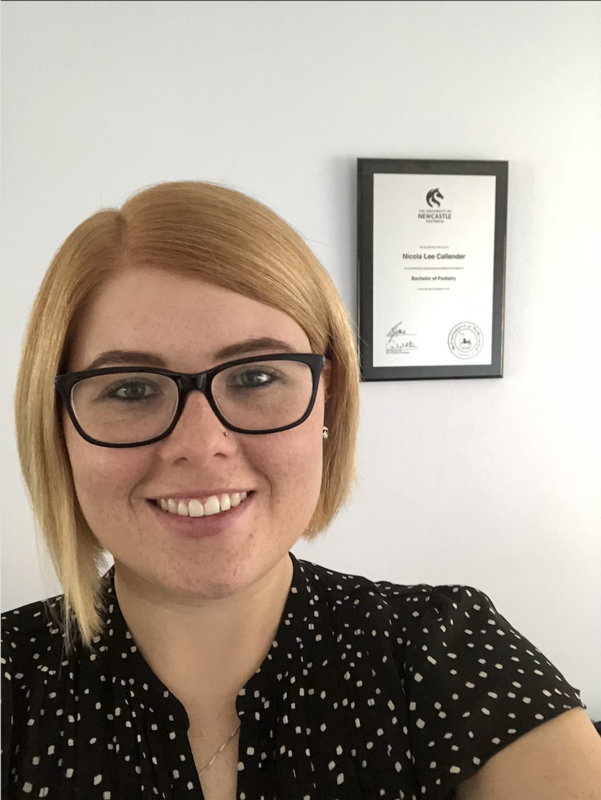 Into her professional career Nicola worked in private practices where Nicola experienced a great need for person-centred care podiatry services in Newcastle. Nicola then established Lakeside Podiatry Services. Nicola was fortunate enough to be able to also be a part of the High- Risk Foot Service at St Vincent’s Hospital in Sydney, this opportunity exposed her to chronic and complex wound management, limb salvage, vascular medicine, haematology and also providing care to the homeless community of Sydney. Nicola was able to work alongside and assist some of the most highly regarded orthopaedic, podiatric and vascular surgeons within Australia. Upon returning to Newcastle where Nicola was then able to focus on utilising the many skills and experiences she gained within public health and implement them into my private practice. Nicola has undertaken additional study in the areas of chronic and complex wound management, total contact casting for Charcot Arthropathy patients, post graduate studies in Dementia Prevention and Management. I am currently in the process of undertaking a post graduate qualification in Endorsed Scheduled Medicines. Nicola consistently practices an evidence-based holistic approach to health care by involving patients within their treatment plans and empower them to look after their health and wellbeing. Nicola also strives to educate and support patients socially and emotionally it is important patients are given the opportunity to ask questions and offer suggestions with their care. Nicola welcomes all patients warmly to Lakeside Podiatry Services and will endeavour to ensure the highest standard of care is delivered each and every time.